When you start out in bookbinding, you usually use blank white paper. Your first, second, and maybe even your third book are all empty pages waiting to be filled. Now be honest with me: how many of you have ever actually written anything in those books? The thing about loving books is that you often develop a reverence for them. Books you’ve made yourself take on a special significance. You can’t just write any old thing in them. You’re saving them for something special. The thing about that is you’re not thinking of the book as a whole. The contents are separate from the structure. And that can make branching into working with printed textblocks more intimidating and challenging than it needs to be. Artists’ books can help with that. When you make an artists’ book, you have to think beyond the form to the content, and how the two interact with each other. They’re a great way to stretch your creative design skills and can help you develop new approaches for working with printed textblocks. We did this exercise in one of my classes last week. It’s easy to do from the bookbinding end of things—none of the students besides me had made a book before, and everyone had a finished book by the end of the class. But the creative side of things allows for many different interpretations, so everyone ended up with a unique finished product. You might want to try and make your own. It was just an accordion book. It was a chance for the instructor to introduce our class to some simple bookbinding techniques. But the book wasn’t really the point. The book was a canvas for our real assignment, to produce a Deep Map of the school and surrounding area. So what is a Deep Map? A Deep Map provides a layered sense of place, incorporating history, memory, natural history, and science in ways that give the viewer a “deep” sense of an area. Deep Maps don’t have to be books. They could be computer generated, or radio shows, or massive tapestries. People often turn to books for information, though. They have authority. By producing our Deep Maps as books, we invite the viewer to question the objective way places are represented, on ordinary maps or in history textbooks, and to seek a deeper meaning of a place. There are plenty of fantastic tutorials available online if you’ve never made an accordion book before. They’re a very friendly and approachable structure. 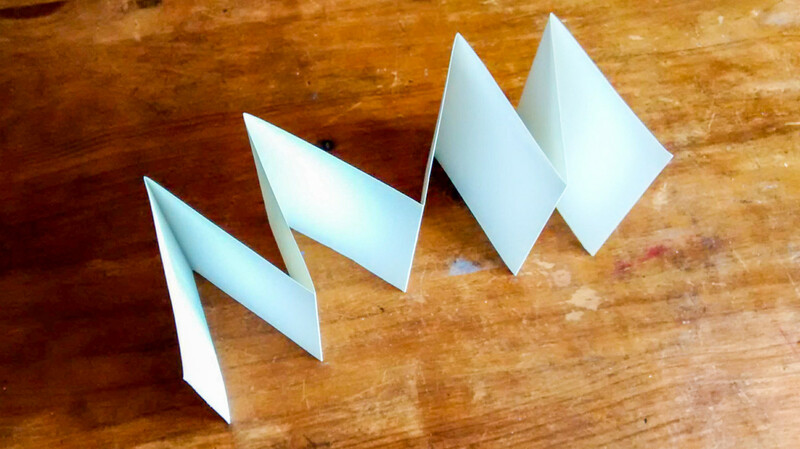 We folded a 30”x5.5” length of paper into eight even panels. We were given two pieces of book board and two pieces of book cloth to fashion some covers. We glued the whole thing together with PVA. And from there, our task was to fill the pages with a Deep Map of our school and the area around it. Because our Deep Maps were taking the form of books, there was a heavy reliance on paper as a material. Found paper from the area takes on a special significance in this context because it is imbued with meaning about our school. The found paper is fun to work with. It can take the form of newspapers, boxes, pages torn from books, old drawings, candy wrappers, ticket stubs, posters, and pamphlets—among other things. We were encouraged to go for a walk through the school and surrounding area to collect our own materials, and to look for other opportunities to capture the spirit of the place. Our instructor was kind enough to offer a few suggestions on how to go about this. We could gather words and text from the area, make sunprints with gathered objects, make drawings of the area as we explore, make rubbing or tracings, or collect stories and memories. The idea was to try and capture the intangible qualities that give our school its character. I ended up with mostly collaged elements, but many of my classmates incorporated poetry and found objects into their books. Now that I’ve done this exercise, I have a pretty good idea what I’m going to do with all the brochures, maps, postcards, and photos I collected on my last holiday. And before my next holiday, I think I might make a few little accordion books to take along and fill up as I go. More than that, though, I’m excited about how I can incorporate ideas of Deep Mapping into working with printed textblocks. The thing about having a reverence for books is that it’s often the stories they contain that draw you to them in the first place. This could be a way to try and capture that reverence in the design of the book. I’ll try making a few more and see how it goes. I'm an avid traveler and perpetual student. At the moment I'm in Canada studying art fundamentals. I tend to learn by making mistakes, but I have a lot of fun along the way!